No.1 fast DVD ripping solution to rip DVD/ISO image to mainstream videos including AVI, MP4, MPEG, WMV, MOV, FLV, M2TS, etc. By digitizing the content in DVD disc, it makes all types of DVDs seamlessly compatible with iPhone, iPad, Apple TV, iTunes, Android, Samsung, Huawei, HTC, Surface, WP8, Chromecast, PSP, etc. The built-in DVD Copy feature empowers you to back up DVD to hard drive & USB, copy DVD to ISO image/DVD folder with original Video, original 5.1 Channel AC3/DTS Dolby Audio, as well as back up DVD main content and title. First-rank DVD ripping and DVD backup software for macOS, which perfectly supports all sorts of DVDs. Built in 370+ profiles: convert DVDs to MP4, H.264, MKV, MOV, FLV, iTunes videos for playback on Apple iPhone, iPad, iPod, Apple TV, iTunes, Android, Huawei, Surface, Chromecast, Nexus, QuickTime Player or for edition in iMovie, iDVD, Final Cut Pro, etc. Back up DVD to a MPEG-2 file with 5.1-channel AC3/DTS Dolby audio and same video quality as the source DVD. Ideal software to rip and sync DVD to iPhone, iPad, iTunes, Apple TV and Mac videos. Based on High Quality Engine and advanced De-interlacing, it delivers remarkable image quality which is near original movie. The software comes prepared with sets of profiles to maximally simplify the ripping process. Solid DVD ripper software for Mac users to convert DVD to MP4, H.264, MOV and M4V that are playable on iPhone, iPad, Mac, Apple TV and iTunes. With ready-made and professional profiles for each device, users can fulfill the ripping process with 3 mouse clicks only while having the flexibility to edit video and personalize profiles as well.. Smoothly play DVD movies on iPad with this smart DVD iPad ripper software. It brings you uncompromised DVD ripping speed by fully supporting Multi-core CPU with advanced DVD digitizing system built in. Moreover, iPhone, iPod, Apple TV are also supported - versatile application for Apple fans and DVD movie fans. The name says it! 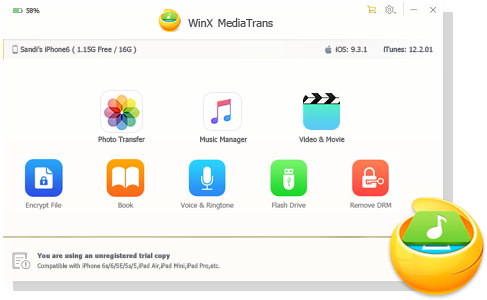 This software is specially designed for ripping DVD to iPad under macOS so that you can watch DVD movies on iPad without limitation, no matter on format compatibility or copy protection. It benefits users by unbeatable DVD ripping speed, top output quality and easiness. It also converts DVDs to Mac videos, Apple TV and music.